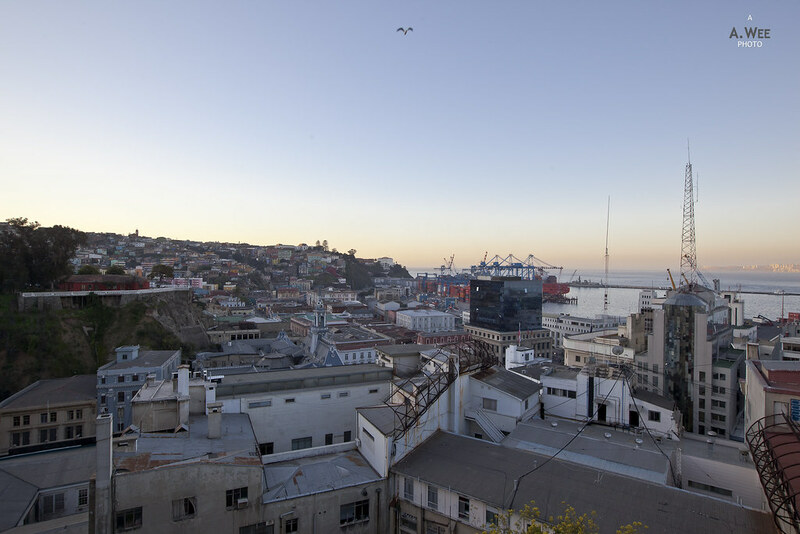 Valparaiso is probably one of the most famous cities or towns in Chile and it is one of the touristy locations that is nearly always featured in guide books and tour itineraries. 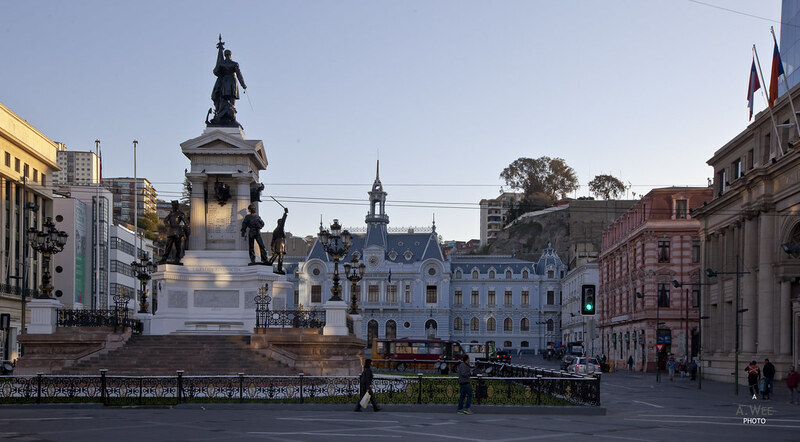 In fact the historic quarter of the city was listed as a UNESCO World Heritage site and is also home to the Chilean National Congress even though the capital of the nation is in Santiago. 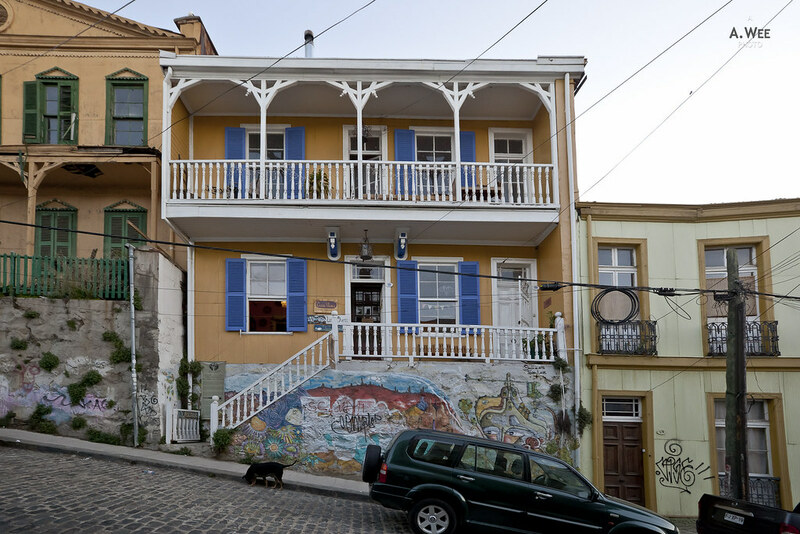 Situated on a hill facing the bay, many residences in Valparaiso have spectacular views and the colourful facades radiates a kind of glow under the afternoon sun. Starting off my tour of this city in Plaza Sotomayor, I face the harbour directly opposite. There is a major train station, with a small mall and the relatively new Ibis hotel just right by the harbour where I parked my car. 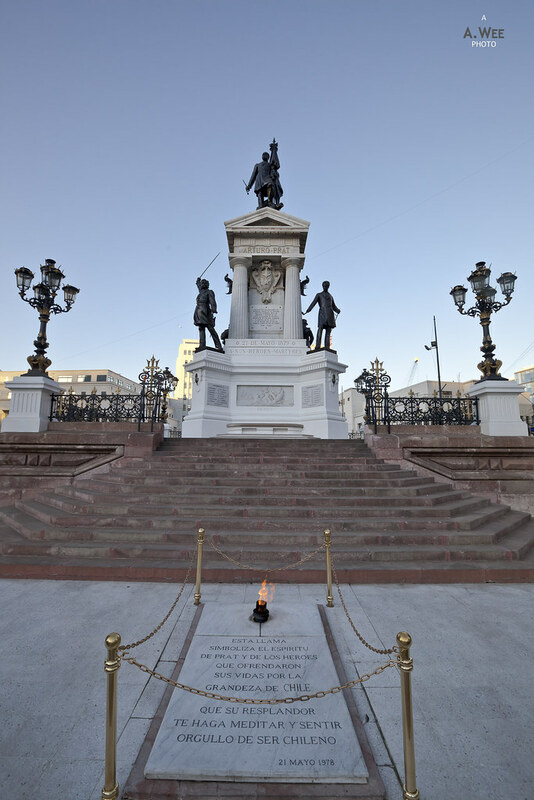 The monument dedicated to the Heroes of Iquique stands in the centre of this civic plaza while a grand looking building dedicated to the Navy of Chile stands behind. It was from here that I started hiking up towards Cerro Alegre. 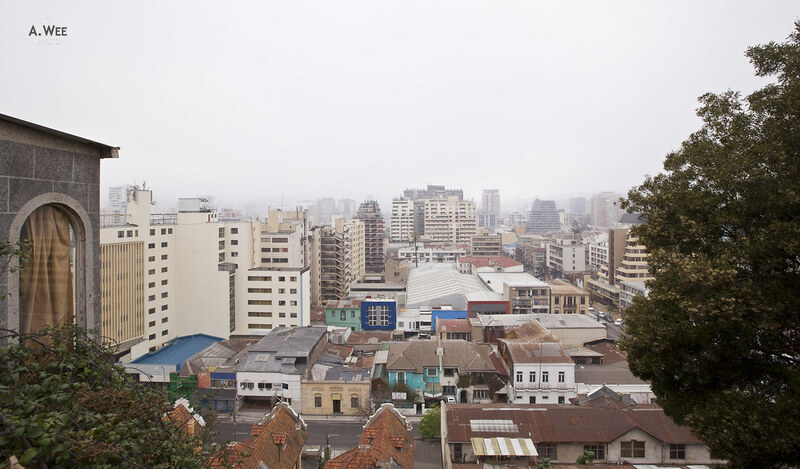 While Valparaiso is famous for its funicular network that will transport people living in the city to their residences in the hilltop, I found it difficult to find the stations if you’re not familiar. Relying on Google Maps and for someone used to hikes, the trek up to the viewpoint along Palacio Baburizza easy enough. Once I reached the top, it was just a case of wandering and letting your own instincts guide you. 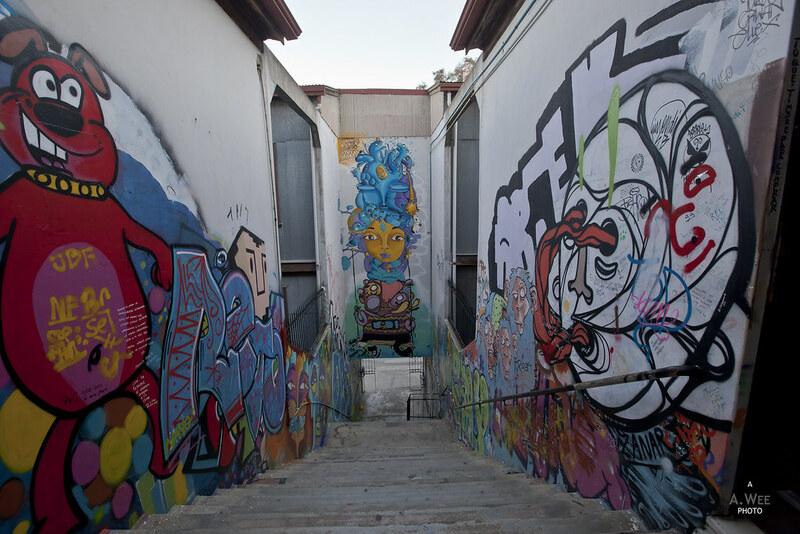 Along the way, you get to appreciate the quirky architecture and the graffiti artworks that grace the narrow passageways. The neighbourhood feels sort of like the ‘hipster’ joints of Portland and walking in the late afternoon, you get to listen in on residents listening to the radio and generally living a relaxed lifestyle. Many of the houses have dogs inside so do not get surprised by loud barking noises that can sometimes appear out of nowhere! 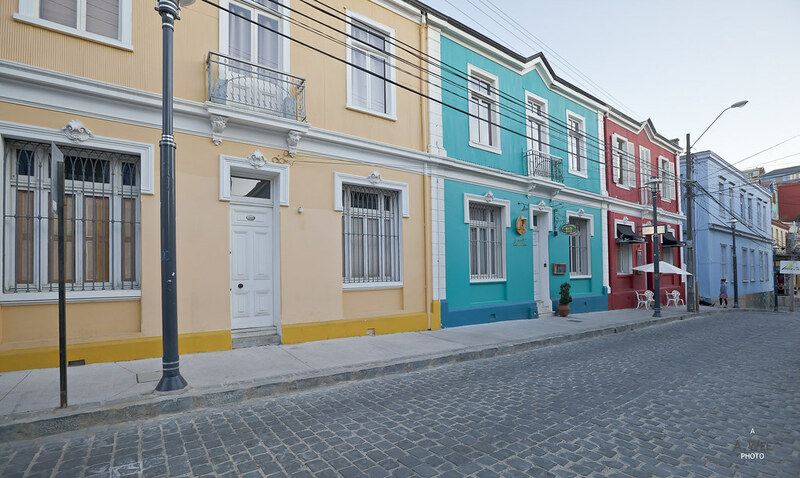 It is possible to drive up to Cerro Alegre but getting a parking spot might be tough and travellers would miss half of the fun walking along the cobblestone pathway while admiring the buildings on both side of the road. Not to be missed around Valparaiso is the colourful facade of the houses up here which becomes more splendid in the setting sun. A splash of colour makes these residences much more interesting and photogenic. Around Cerro Alegre, travellers can find numerous cafes and restaurants to take a break from the trek. It must have been the lull tourist season when I visited because the area was generally quiet but I figured it would be teeming with people during the summer time. 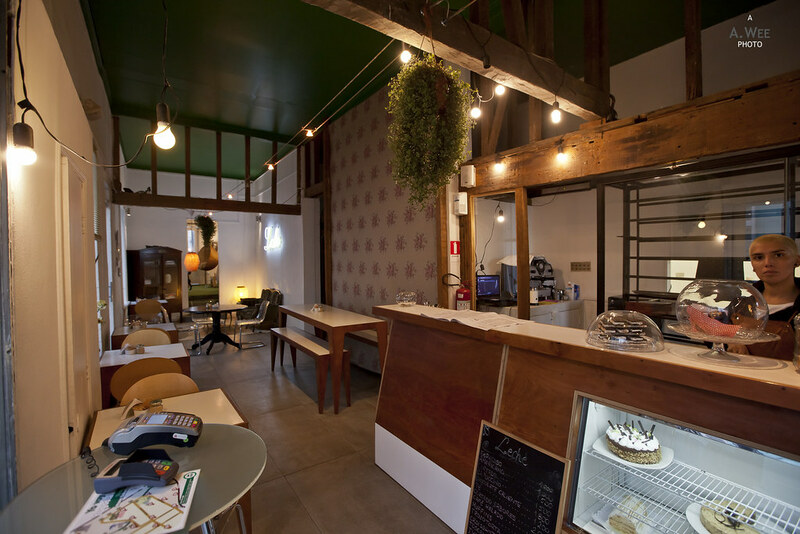 These little cafes would also provide a respite to weary travellers after making the trek up the hill. Aside from cafes, there are also numerous bed and breakfast scattered around the residences along Urriola and Templeman. 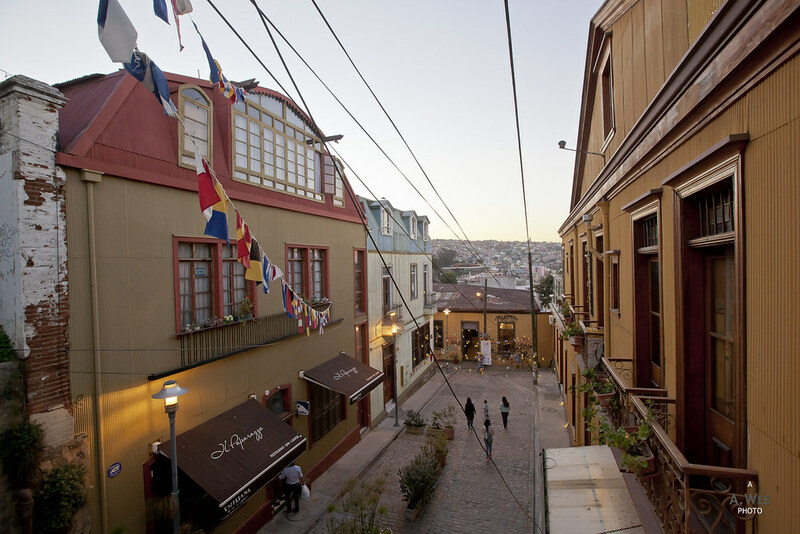 These lodging would suit travellers looking to explore Valparaiso in depth. Those staying in one of the B&B’s would also find restaurants around Cerro Alegre and some of these have patios that are decorated to create a festive and carnival-like atmosphere. With the afternoon spent walking around the Cerro Alegre neighbourhood in Valparaiso, I ended the evening with a stroll by the casino promenade in Viña del Mar. 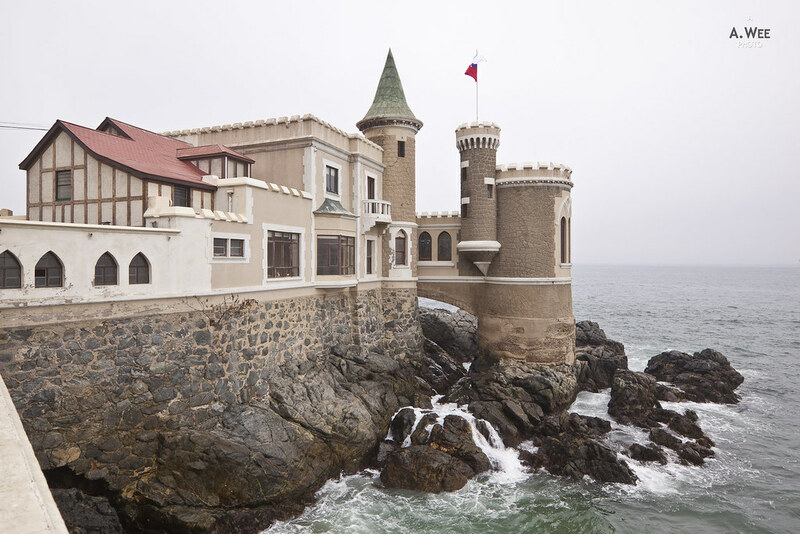 If Valparaiso is the rough-on-the-edge teenage city, Viña del Mar is like that suave gentleman city with grand colonial style castles, tall condominiums along the waterfront promenades and wide avenues filled with traffic. 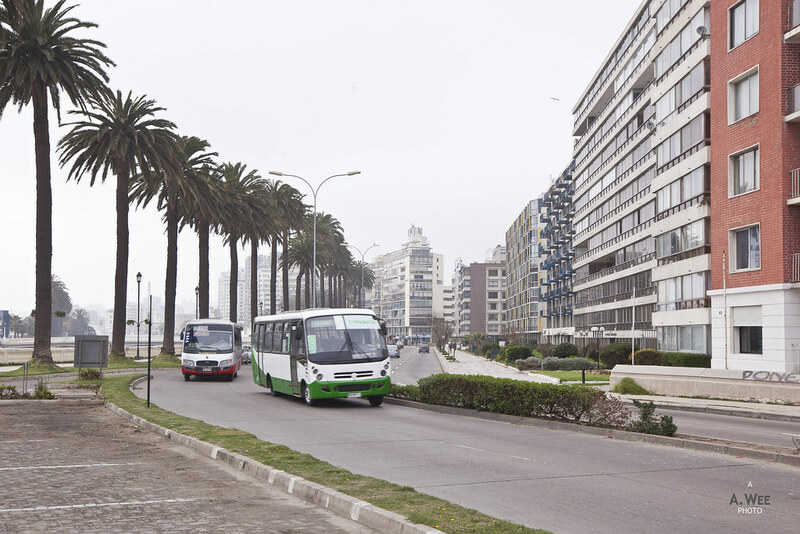 The Marina Boulevard connects the Sheraton Miramar on the waterfront with Avenue San Martin where the main casino is located at. Walking along this stretch allows for some nice Pacific Ocean views along with several landmarks like the Castillo Wulff and the Hotel Cap Ducal in the unmissable shape of a boat. At night the casino promenade is brightly lit up with Avenue San Martin being the focal point for night life in the city. Numerous restaurants and bars along with hotels can be found along this stretch. This was also where I ended up for the night having a dinner of Pastel de Choclo at El Rincón de Greda restaurant. 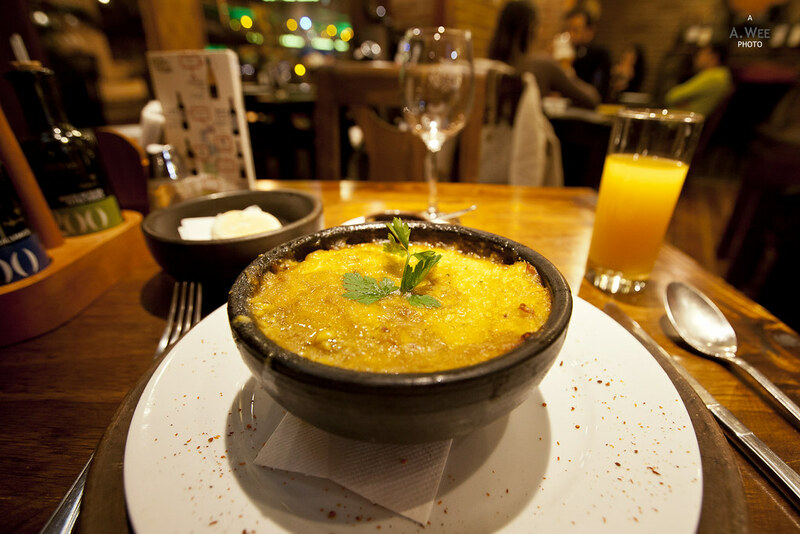 Pastel de choclo is a heartwarming comfort food for Chileans and it certainly makes for a warm treat on a cold winter night. Served hot on a stone bowl, the dish is made up of a mashed sweetcorn with beef fillings. Sweet and warm are adjectives I would use to describe this dish! 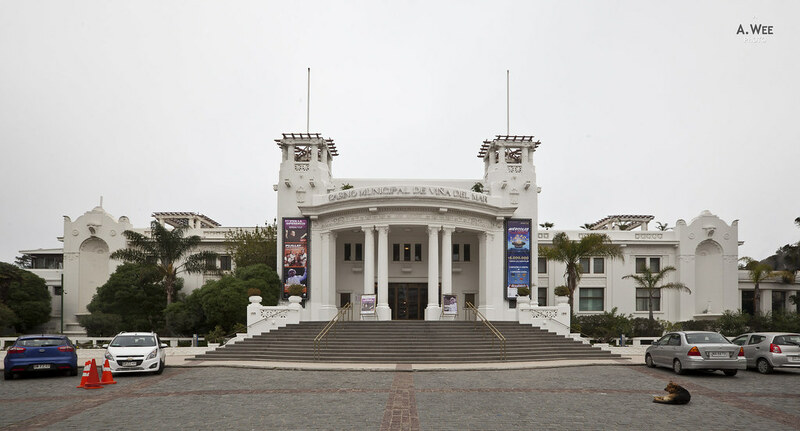 Viña del Mar seems to be a larger city but it does not have the distinct character of Valparaiso, though it makes for an easier place to drive around and park in, making it more suitable for families to stay in while exploring both Valparaiso and Viña del Mar. Both cities can decently be explored in about 24 hours but I barely had the time to explore the other neighbourhoods in Valparaiso or take one of those funicular rides. Speaking of rides, there is actually a train that connects both cities passing by the coast, and driving between the 2 cities is also a pleasant experience. 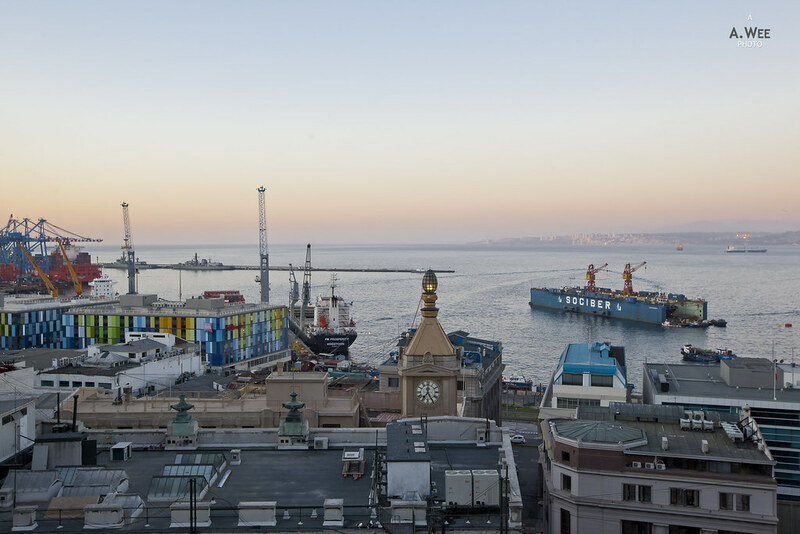 With the vineyards along the way, a weekend trip to Valparaiso and Viña del Mar can certainly make for a nice escapade from Santiago!